Interest rates have been a popular subject in the past few years. After years of record-low interest rates, the U.S. Federal Reserve has hinted at a policy trend of increasing rates for more than a year. Other than a small, single rate increase late in 2015, rates have mostly remained in a holding pattern. In contrast to the U.S., several other counties have lowered interest rates to negative levels in hopes of spurring their economies. At the farm-level, interest rates have several implications. Interest rates impact farm expenses and are a key fundamental driver of farmland values. Given declining net farm income and tight margins, credit worthiness is also a consideration in agriculture today. All this led us to digging into the Kansas City Federal Reserve Bank’s data on farm loans and interest rates. Specifically, this week’s post look at the distribution of farm loan interest rates. After several years of declining interest rates, rates inched higher in 2015 and 2016. The average interest rate on non-real estate farm loans for the first quarter of each year is shown in figure 1. Since 2014 average interest rates increased from 3.92% to 4.20% in 2016. While the trend is for higher rates, the rate of change has been rather slow (28 basis points over two years) and the past three years (2014-2016) are the lowest rates over the past 10 years. Figure 1. Average Interest Rate on Non-Real Estate Farm Loans. 2007-2016, First Quarter Data. Data Source: Ag Finance Databook. While the average rate is useful, it hides some important detail. 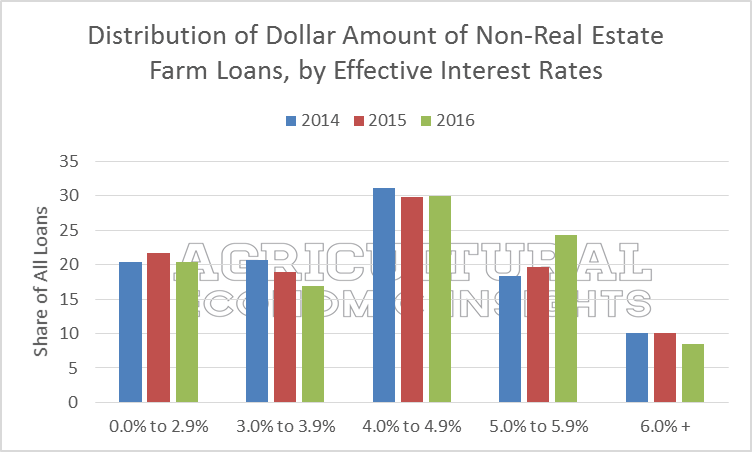 In figure 2, the distribution of interest rates farmers paid on non-real estate farm loans is shown (again, first quarter data). This gives us a perspective on how high, or low, non-real estate farm loans were issued at. In 2007, only one-third of loans were at rates less than 8% (blue and red bars). Today, nearly all loans were issued with interest rates less than 8%. At the other end of the spectrum is the current share of low rates; nearly two-thirds of non-real estate loans issued in the first quarter of 2016 were at rates less than 5%. If these levels would have been suggested in 2007, when fewer than 1% of loans were at rates lower than 5%, it would have been unbelievable. This has been an underappreciated aspect of the recent agricultural boom and current slow-down. Producers have been able to borrow money at exceptionally low interest rates. Figure 2. Distribution of Interest Rates for on Non-Real Estate Farm Loans. 2007-2016, First Quarter Data. Data Source: Ag Finance Databook. Focusing on data since 2014, we can take a closer look at the distribution of interest rates (figure 3). In general, the distribution has stayed relatively stable over the past three years. This would be expected given that rates haven’t changed much. For example, over the past three years nearly 20% of non-real estate loans were made at rates of 2.9% and lower. While there have not been sweeping changes in this distribution, there has been subtle changes. The share of loans made between 3.0 and 3.9% accounted for 20.7% of loans in 2014. In 2016 this share fell to 16.9%. Over the same time period, the share of loans made at rates between 5.0% and 5.9% increased from 18.4% to 24.2%. So what does this mean? The increase in average interest rates has been driven by a higher share of loans being made between 5.0 and 5.9% interest rates and smaller share of loans better 3.0% and 3.9% rates. The rate increase has not been on the extremes – the loans made and the highest or lowest rates. Figure 3. 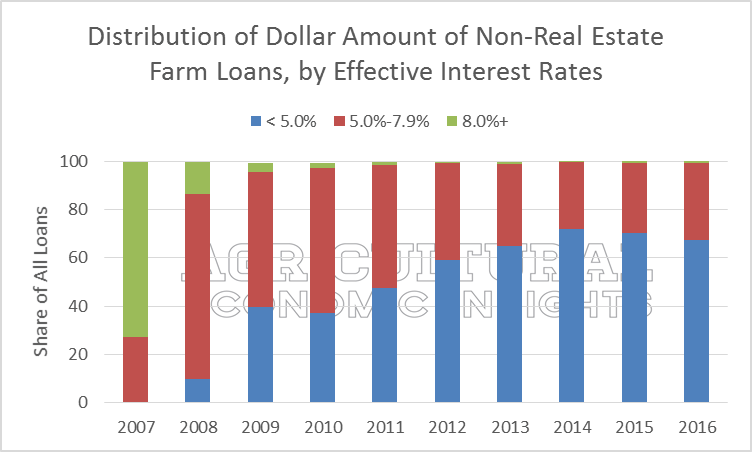 Distribution of Interest Rates for on Non-Real Estate Farm Loans. 2014-2016, First Quarter Data. Data Source: Ag Finance Databook. 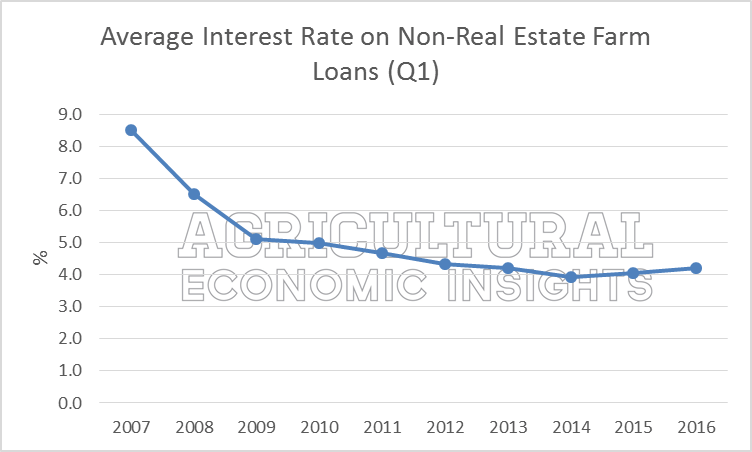 Even though interest rates on non-real estate farm loans have ticked higher in recent years (figure 1), current rates are still among the lowest in 10 years. Further, two-thirds of loans are at rates of less than 5%, an interest rate level that fewer than 1% of loans were made at a decade ago! This has been an important supporter of the ag economy in recent years. Taking a closer look at conditions since 2014, data reveal the small uptick in interest rates on average. This occurred as a larger share of ag loans were made with rates between 5.0% and 5.9%. This is noteworthy as the shift of higher rates has not been across the board or on the extremes. Furthermore, this will be an important distribution to watch should credit conditions get more difficult in the coming months and years.